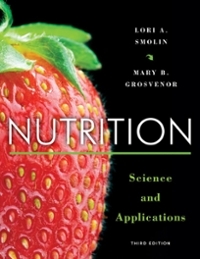 Nutrition 3 Edition Nutrition: Science and Applications, 3rd edition helps develop the scientific understanding to support personal and professional decisions. Using a critical thinking approach, Smolin brings nutrition out of the classroom and allows students to apply the logic of science to their own nutrition concerns both as consumers and as future scientists and health professionals. The text has been developed through collaboration between the authors and the Nutrition Advisory Board, a team of dedicated nutrition instructors who help review and develop all of Wiley’s nutrition resources. Access to WileyPLUS sold seperately.